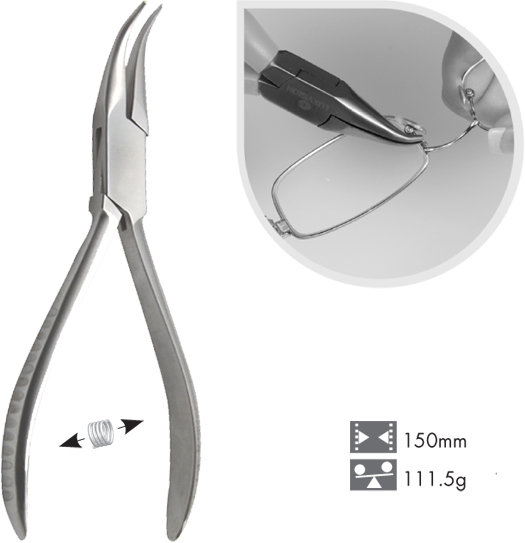 A stainless steel pliers with a precision curved jaw for working in tight areas of an eyeglass frame. Excellent for adjusting the guard arms of metal frames. The curved jaw is strong and will not flex when making difficult bends and adjustments. A great companion tool when two pliers are needed at the same time for an adjustment/ repair. Ribbed handles provide comfort and a sure grip when in use.